Up to 250 jobs are to be created in Northumberland by a firm planning to build electric-powered 4x4 vehicles. Oxford-based Liberty Electric Cars intends to produce more than 1,000 "plug-in" Range Rovers a year as part of a £30m investment in Cramlington. Regeneration agency One NorthEast, which helped broker the deal, said the region's economy would benefit by about £120m a year. The vehicles are likely to cost about £125,000 and have a 200 mile range. Barry Shrier, chief executive of Liberty, said: "The Liberty Electric Range Rover takes electric vehicle technology into large luxury cars that people aspire to drive, particularly in cities and urban environments where environmental controls are becoming increasingly tighter. "North East England is fast becoming a world leader in clean energy, infrastructure development and electric vehicle manufacturing, which is why we feel that our business will prosper here." 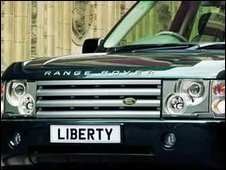 There is no commercial deal between Liberty and Land Rover, but the luxury car maker has been involved in technology trials and developments. The company said it had already been inundated with prospective orders, mainly from corporations looking to expand their executive fleets. Alan Clarke, chief executive of One NorthEast, said: "This investment is excellent news for the region and places the North East at the forefront of electric vehicle manufacture and infrastructure development." Nick Brown MP, minister for the North East, said: "The North East is home to a number of exciting projects in the renewable energy sector which can make a real impact on the region's employment base. "The creation of 250 jobs from the Liberty Electric Cars project demonstrates this." A prototype building programme is already under way at Cramlington's Nelson Industrial Estate, with the first adapted Range Rover expected to come off the production line later this year.